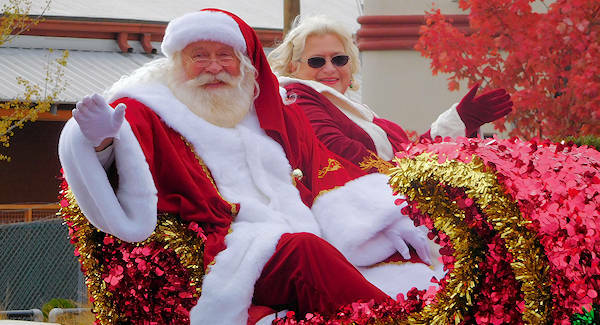 The festive Asheville Holiday Parade in downtown is a fun way to kick off the Christmas season - complete with local personality for plenty of smiles. It starts at 11 AM, so several downtown streets will be closed that morning. Come early to find you a spot along the one-mile route. 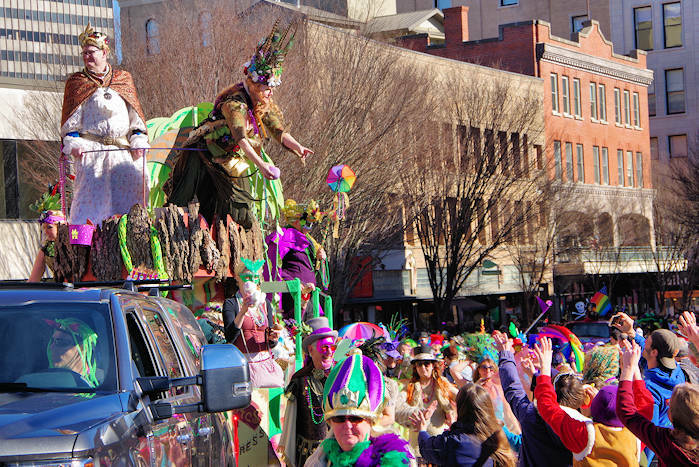 Above, the Asheville Second Line (don't miss their Mardi Gras Parade). 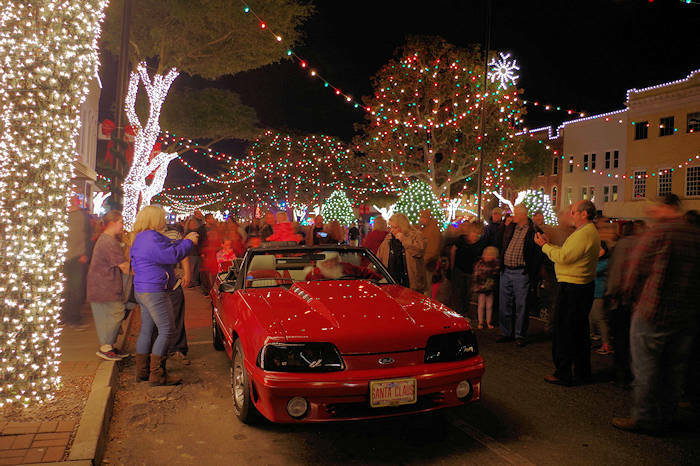 For more fun in November and December, see our Top Holiday Season Things to Do. 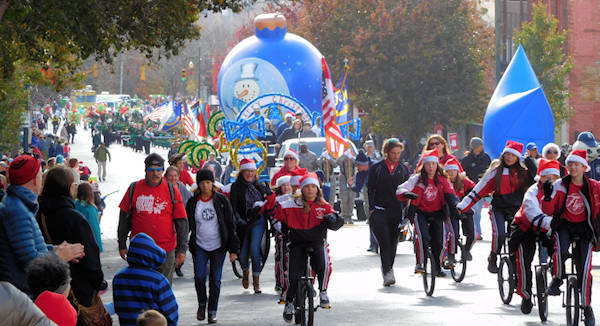 The parade route travels up Biltmore Avenue from Charlotte Street towards Pack Square. Pack Square is the only performance area, the location for WLOS TV cameras and judges. The parade then turns left on Patton Avenue and ends on French Broad Street. Celebrating 70+ years, the parade features 100 entries including marching bands, dance and cheer squads and festive floats. 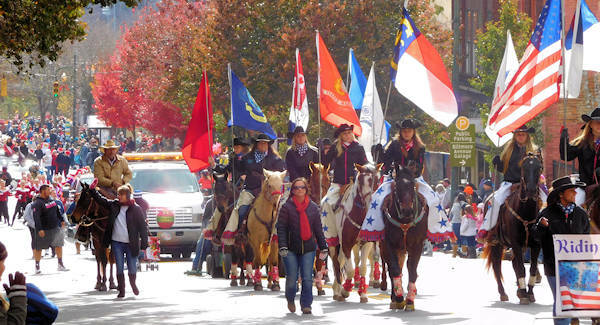 The 90-minute parade features of entertainment for all ages. 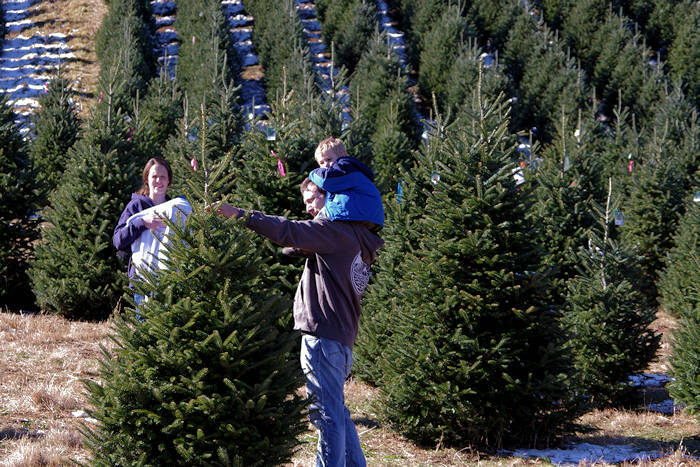 Since it's Asheville, you'll never know what you'll see along the way! Even the Christmas parade needs some weirdness. 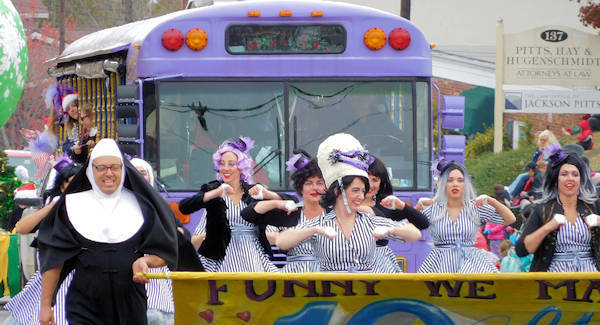 LaZoom Tours is always a crowd favorite with their purple bus and variety of characters, led here by Sister Bad Habit. 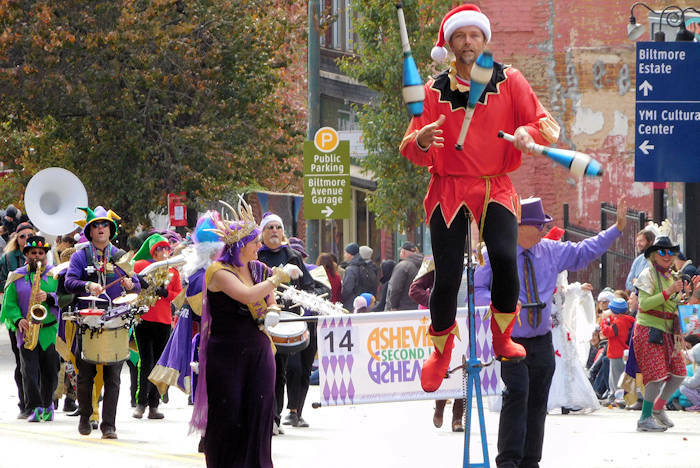 After the parade, start your holiday shopping in downtown Asheville. 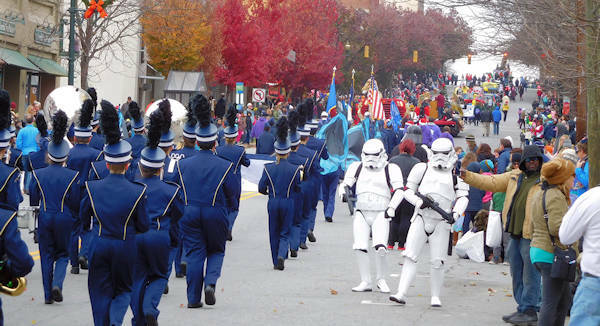 The Parade will line up along South Charlotte Street which will be closed to traffic beginning at 7 AM. 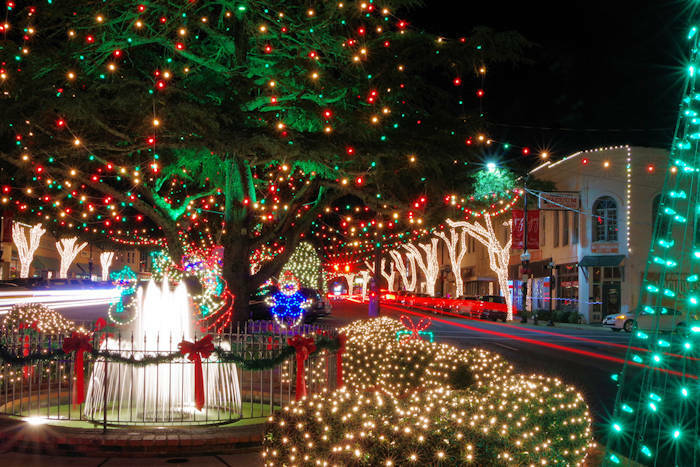 That evening at 6 PM, watch the lighting of the Winter Lights trees at Pack Square, presented by the North Carolina Arboretum’s Winter Lights. 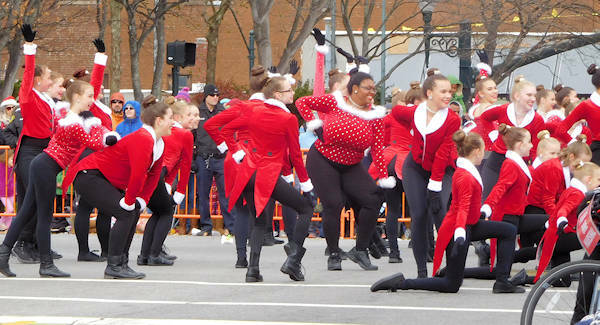 Watch our 3-minute Asheville Holiday Parade Sampler from 2016!